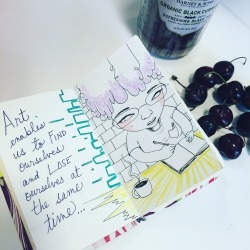 An article by the wonderful Marissa Del Toro whom we met earlier this year and visited us to learn about our zine and collect our oral histories as individual artists and collective. 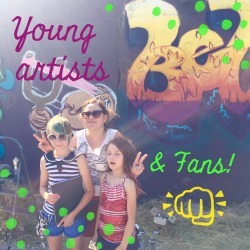 Thank you Marissa and Aztlan Collective for the support! In my gallery you’ll see I’ve tried my hand at cloth dolls before. This time I worked with two new designs. 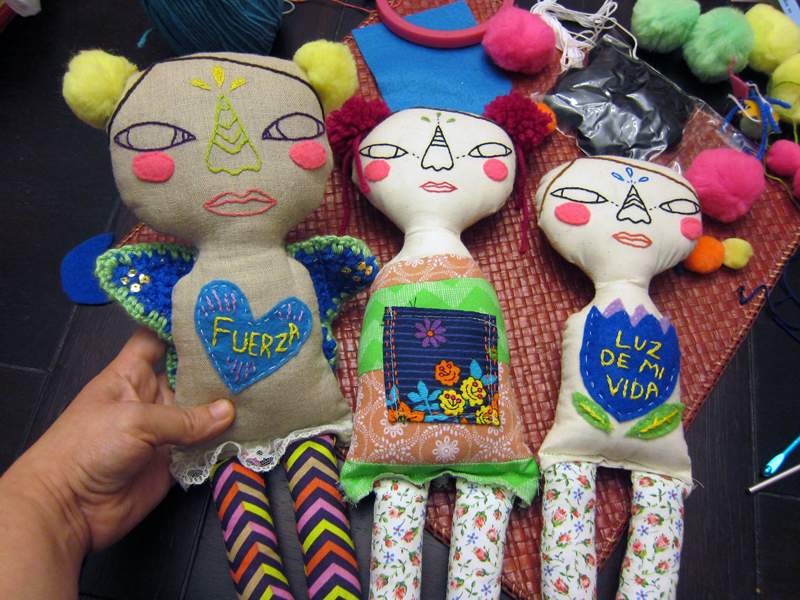 I worked in the various hand craft I enjoy for these new dolls which I am calling Muñecas de Luz (Dolls of Light). I must share the interesting events taking place as I was creating them. In the month of November and earlier in December I was interviewed by two female writers/artists working on two different projects. 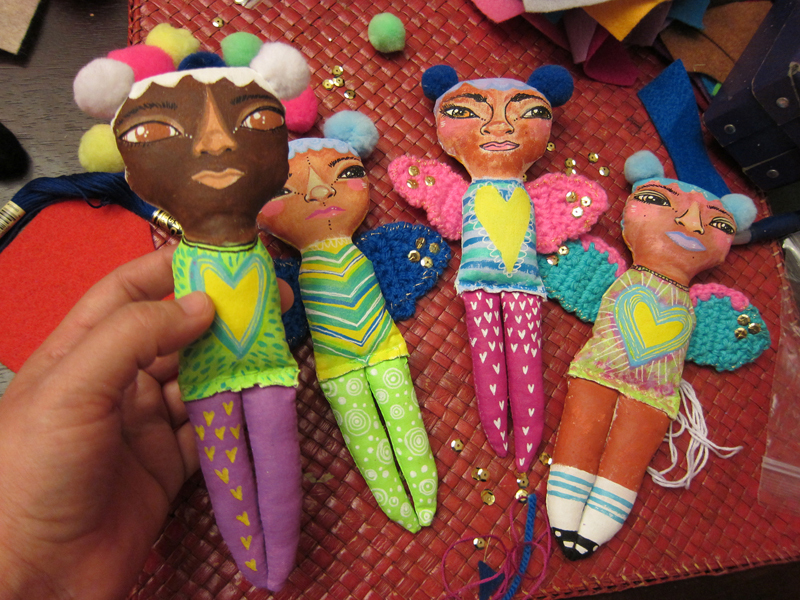 The first interview for a project about Chicago artists’ migrant stories took place as I was starting the dolls. The story of my Chicago roots tightly intertwined with my father’s, my mother’s, my grandparents’ stories. Not only a cultural history but also one of traumas carried and passed on through the generations. I hadn’t done an interview quite like this before. It helped me see what my intentions really are with my art and what I was trying to express with these dolls waiting for me at my studio. It was deep. That evening with my heart still swimming in those stories, I kept listening and the messages these dolls should carry came to me. I also began crocheting a pair of butterfly wings. The second interview came a couple of weeks later and was for a writing project about Latina artists creating work in Chicago. 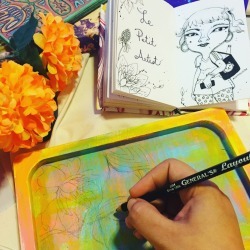 In this interview I shared how I ended up on an artistic path, on this quest to becoming an artist. 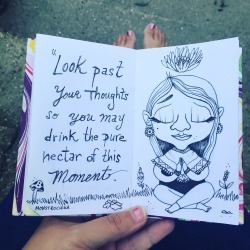 It really helped me to look again at all the work I have been doing and how far I’ve come from first being inspired by a Latina artist to hopefully becoming an inspiring Latina artist myself. 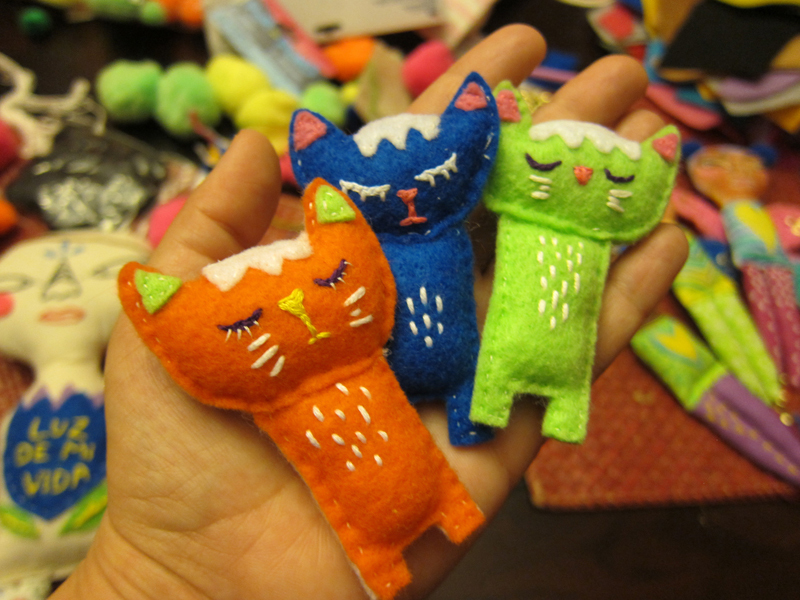 I mentioned the dolls and what I came to realize as I continued to work on them. My thoughts about how we give dolls to our young girls and what are the important messages we really want to give them. As well as how we can give dolls to women of all ages to pass on hope, love and light especially in this current political climate. I can’t believe another year is coming to a close. So grateful for all the projects that came through the studio this year. Especially those that cross your path quite accidentally, impacting your work in such a meaningful way and helping you grow as an artist. My story is in my work. I am a storyteller. One of many stories, one like many stories. My work is of joy, sadness, resilience. Being able to really speak and share my story has helped give me more direction in the type of work I want to create moving forward. In the new year I hope to: Post on here more often. 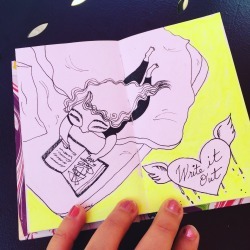 Make a new zine. Make new paintings. Start an Etsy shop or other. Go out and just observe and pick up my camera again. Make time to care for self better. Hope, love and light in the New Year friends. Happy New Year to everyone! 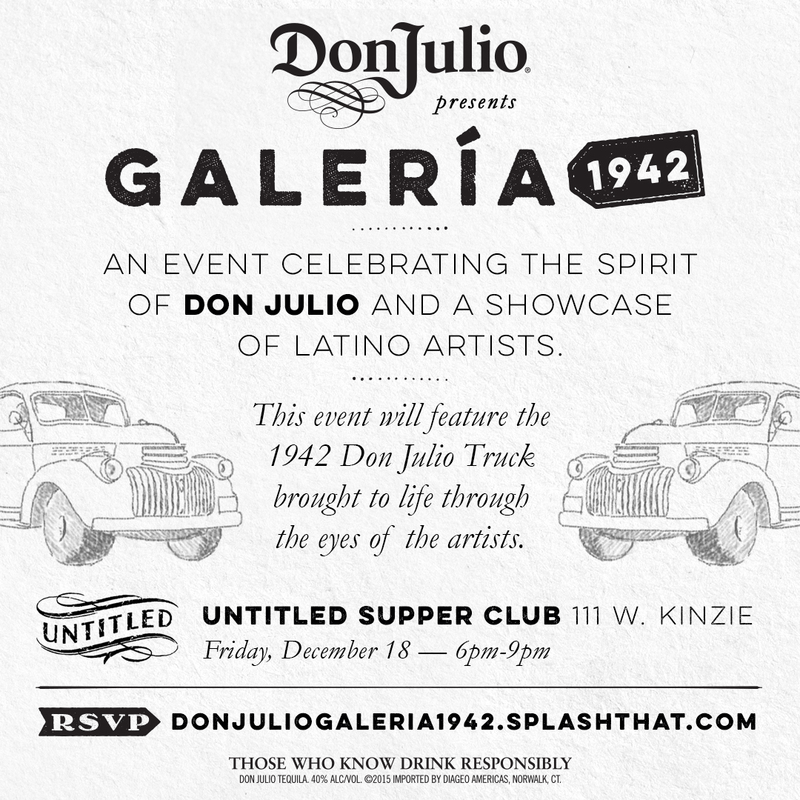 I am sharing here with you a video of the amazing project I was a part of thanks to artist Sam Kirk and Don Julio Tequila. 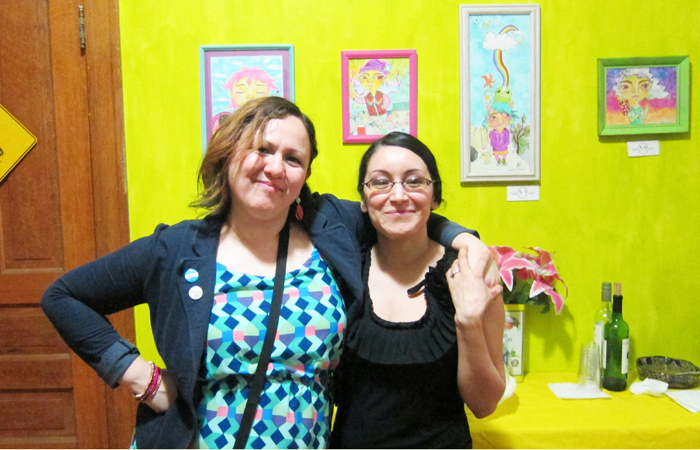 It was a great way to close out the year with 14 other local Latino artists here in Chicago. It truly was a spectacular time so a big congratulations to everyone involved! 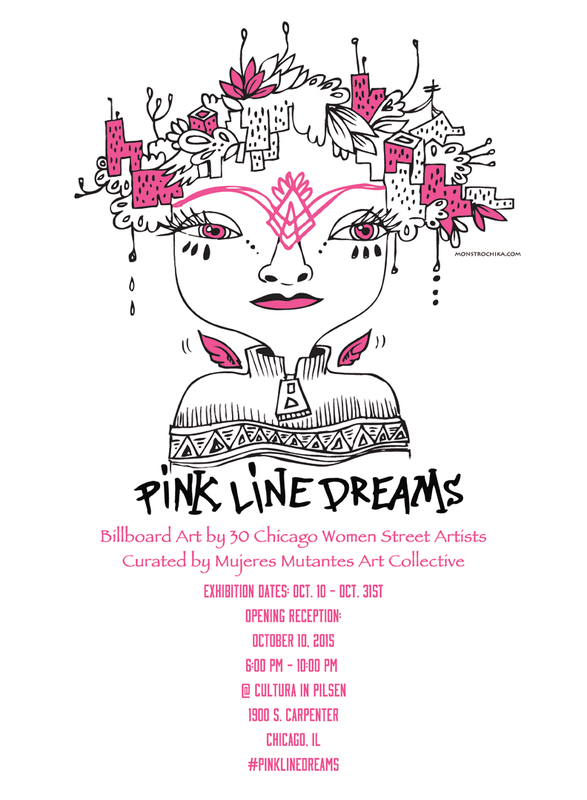 As part of Chicago Artist Month 2015, Mujeres Mutantes Collective brought together a local Chicago women & street artists exhibition at Cultura in Pilsen on Saturday, October 10, 2015. 30 women artists will exhibit their works created on model size billboards by Boundless Brooklyn. 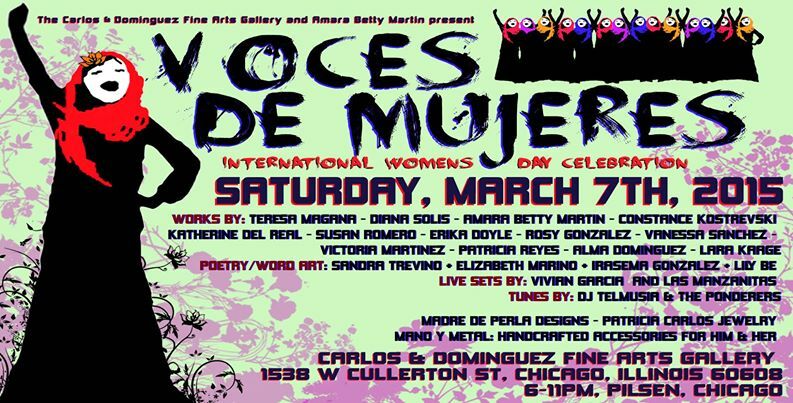 Revista Contratiempo’s Hecho en Chicago live poetry readings and Sounds by DJ duo The Ponderers and DJ Rebel Betty will complete this fantastic event! Come on out! 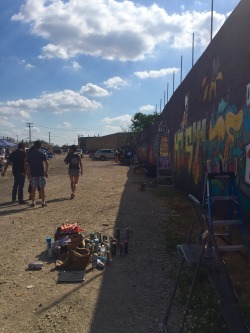 Monstrochika @ West Fest 2015. 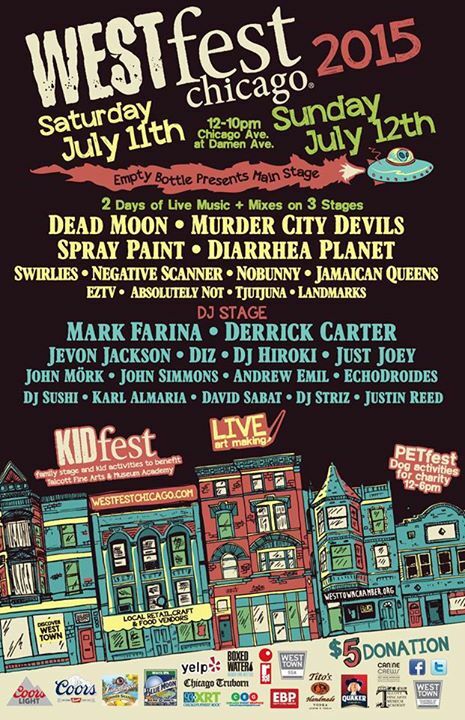 I’ll be live painting 12pm – 4:00pm with other artists at West Fest tomorrow. Come out and groove to some rock and house music. See you there! 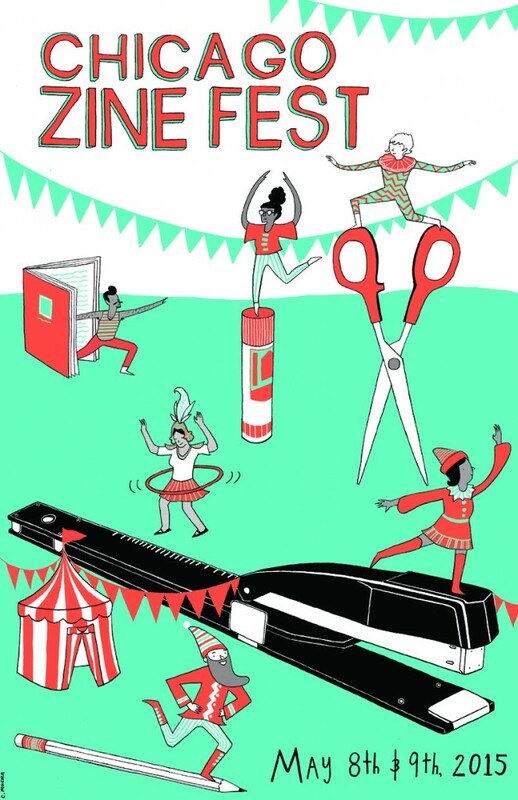 Kick Off Summer @ “All of Me” Body Positivity Art Show & Zine Release Party! It looks like summer may finally be settling in for its stay in Chi-Town! 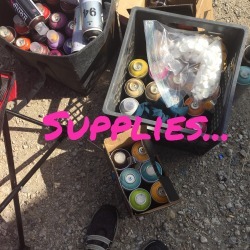 There are some all women artist mural productions planned this month that I am so excited to contribute to! 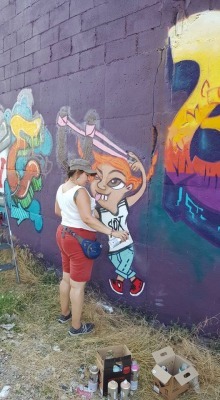 Back in 2007 I was lucky to road-trip out with friends to paint at my first B-Girl Be Summit at Intermedia Arts in Minneapolis. This weekend is their 10 year reunion exhibition! My proposal was accepted last month and I worked really hard pouring my heart into my piece for this show which opens June 11 and runs thru August 22, 2015. So happy and proud of the work Intermedia Arts continues to do! This Friday another little milestone for me as an artist. Last year I had a crazy little idea that I finally decided to share with others. Slowly but surely it has blossomed into a beautiful collaboration amongst some of the coolest and talented women artists I am lucky to know in my city. 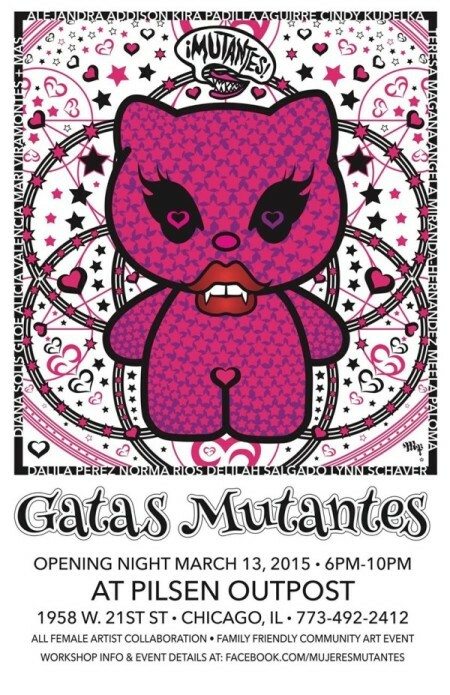 We will celebrate the release of our 2nd issue of MUTANTES! Art Zine this Friday, June 12th! Art, grooves and great people will gather. The “All of Me” Body Positivity and Zine Release Party will kick off the summer arts events for us here in Chi-Town. 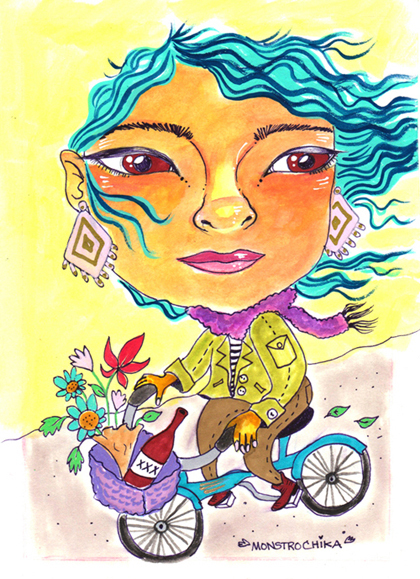 Following will be Expo Collective’s first Quetzal Art Fest on Saturday, June 13th. I will be holding a plush doll workshop at noon that day and the fun will continue with live painting along side some of Pilsen neighborhood’s brilliant artists! Hello again! I’ve been meaning to post the latest but as we all artists know, sometimes projects and deadlines can come so close and almost collide! The solo exhibition was a great success thanks to Leticia at Reciclarte Studio and my friends and family that came out to support! Thank you! 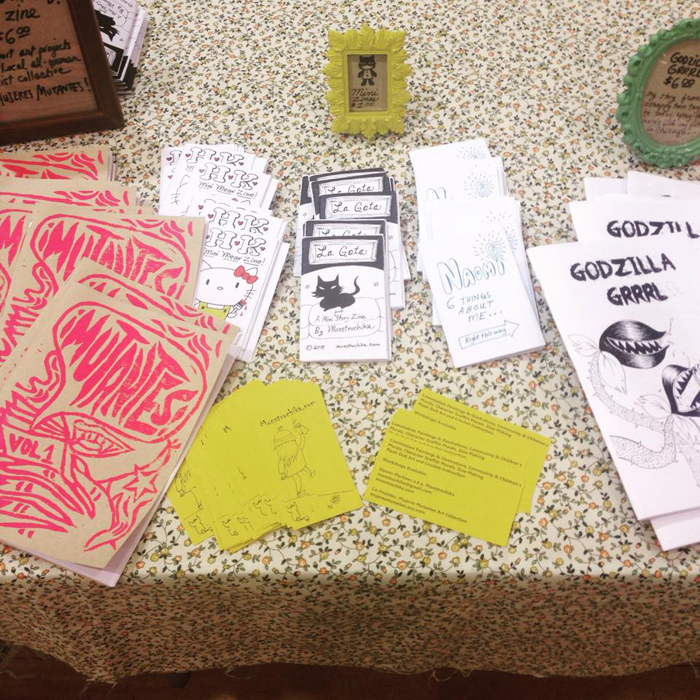 Chicago Zine Fest came overnight it seems after that! 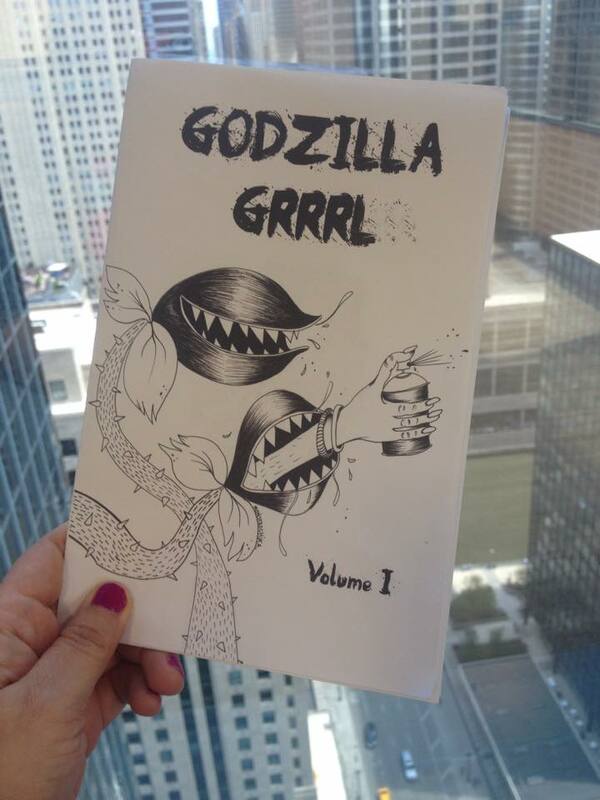 The entire month of April was spent finalizing a personal story and putting my zine GODZILLA GRRRL together for release at the fest. This first volume includes my story from scrappy teen tagger through today painting graffiti murals with my girls in Chicago. If you are in the Chicago area, you can purchase at Pilsen Out Post and Quimby’s Bookstore. You can also email me directly for a copy. $6.00 USD + shipping. I had such a great time attending interesting panels and meeting some pretty awesome zinesters. CZF was overall a very welcoming and highly inspirational experience! I hope to return next year. In May I received some pretty great news. The proposal I submitted to exhibit at the 10 year reunion of the B-Girl Be Summit in Minneapolis was accepted! If you have read Godzilla Grrrl you know things just keep coming full circle. Art is life! So the month of May was dedicated to the completion of that proposal project. Details and pictures in my next post! Loss, misunderstandings or life’s changes can all lead to an aching heart. We can all relate to longing for people, for places, for change. Some will runaway to follow their dreams and some will stay and kiss those people goodbye. My very first solo exhibition is all about yearning hearts, runaways and goodbyes. 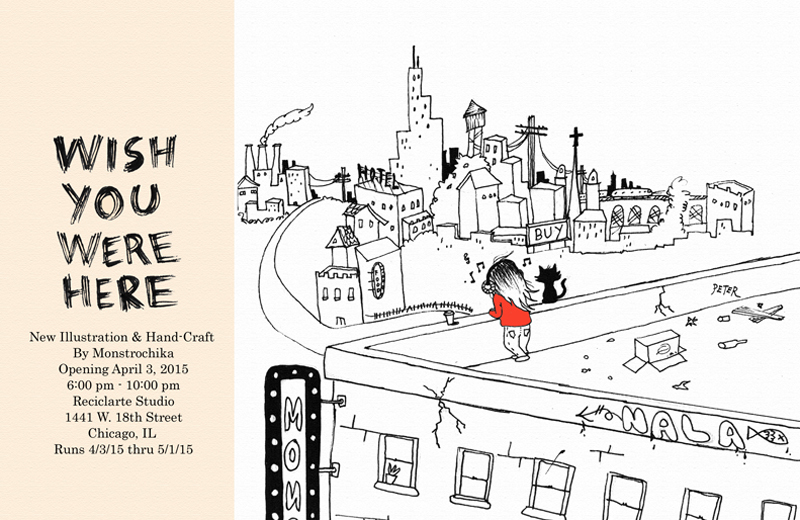 “Wish You Were Here” will feature all new illustration and hand-craft work. Opens April 3, 2015 at Reciclarte Studio, 1441 W. 18th Street in the Pilsen neighborhood of my sweet home Chicago . For those who cannot be at the opening. The show will runs 4/3/15 thru 5/1/15. Reciclarte shop hours are: Friday & Saturday (10 am – 8 pm) and Sundays (10 am – 7 pm). Thank you to all for your continued support!